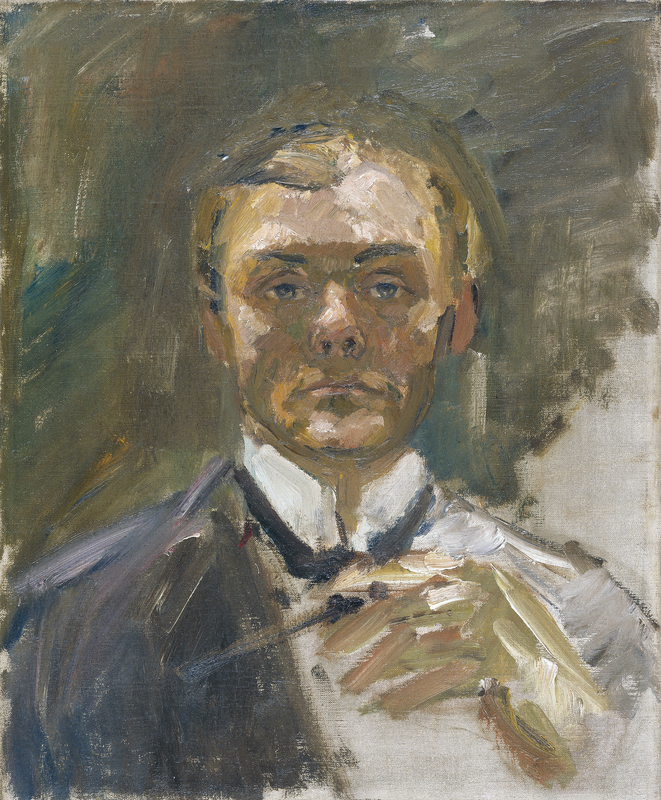 The extensive gallery of self-portraits left by the German painter Max Beckmann allows us to trace the abrupt changes in his agitated life and his vast oeuvre. The present Self-Portrait with Raised Hand, one of his earliest, which he painted in summer 1908 in Hermsdorf, the district of northern Berlin where his studio was located, provides a powerful image of the artist at the age of twenty-four. Its unfinished look, with some parts of the canvas exposed, accentuates the loose, impastoed technique that links him to German Impressionist painters like Max Liebermann, Lovis Corinth and Max Slevogt. Although full-or three-quarter-length self-portraits are predominant in Beckmann’s output, the present work shows the artist slightly more than shoulder length in a fully frontal pose that allows him to stare at the viewer with his challenging gaze, while raising his left hand. Peter Vergo relates this expressive gesture to other Expressionist portraits of the period, particularly those of Egon Schiele, although Beckmann’s portrait is much more restrained. Some authors associate the position of the hand with the gesture of holding a paintbrush; however, the artist may have intended to show himself smoking a cigarette, as in his Self-Portrait in Florence painted the previous year or in the many later selfportraits in which he haughtily surveys his surroundings and expresses his irony about the tedium of modern life. Vergo also suggests the possible influence of Byzantine icons showing Christ the Saviour in a very hieratic pose raising his hand to give blessings. The identification of the artist with Christ, in the tradition of Dürer’s self-portraits, is fairly relevant to the case of Beckmann, an artist with an epic and heroic view of painting who used selfportraiture to show himself to the world as a hero of Homeric proportions. The work was given its current title by its first owner, Reinhard Piper, who acquired it directly from the artist before 1914. Piper, one of the most important German avant-garde publishers, who was closely linked to the Expressionist circles of the Der Blaue Reiter group, for whom he published the Almanac of 1912 and Kandinsky’s essay Über das Geistige in der Kunst (Concerning the Spiritual in Art), mentioned in his autobiography, “I acquired one of Beckmann’s earliest paintings; the Self-Portrait with Raised Hand, which is not entirely finished.” The work was purchased by the Los Angeles collector of German Expressionist art Robert Gore Rifkind in 1974 and passed to Baron Thyssen-Bornemisza in 1985.